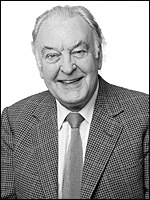 A jovial, sometimes bombastic leading man, noted for his rich, plummy voice, Donald Sinden was one of the Rank Organisation 's leading contract stars between 1954 and 1958, particularly in light comedy roles. On stage since 1941, with Stratford and Bristol Old Vic seasons, he made his film debut in 1948, but his film career only took off in 1953, when he appeared as Lt. Lockhart, Jack Hawkins 's second in command, in Ealing 's superb naval drama The Cruel Sea (d. Charles Frend, 1953), probably his finest film role. This led to a Rank contract and the phenomenally successful Doctor in the House (d. Ralph Thomas, 1954), in which Kenneth More and duffel-coated Sinden regularly failed their finals, spending most of their time chasing pretty nurses. In 1956, he had a rare role as a ruthless robber, murdering a cinema manager (Odeon, of course) and ruthlessly trying to eliminate the only Eyewitness (d. Muriel Box, 1956). More typically, he was a songwriter who finds himself landed with An Alligator Named Daisy (d. J.Lee Thompson, 1955), in which his comic timing was seen to good effect, and as hero in the underrated atmospheric thriller Tiger in the Smoke (d. Roy Ward Baker, 1956). Following non-renewal of his Rank contract in 1958 (affected like many others by British New Wave acting styles), he threw himself wholeheartedly into the theatre, joining the Royal Shakespeare Company in 1963, receiving great acclaim in Shakespeare and other classical roles. Since the '60s, he has appeared in occasional films, in character roles in telemovies (e.g., The Canterville Ghost , d. Sydney Macartney, 1997), and starred in such series as Two's Company (LWT, 1975-9). He was awarded a CBE in 1979 and knighted in 1997. He is the father of actors Jeremy Sinden and Marc Sinden (b.London, 1954), who has appeared in several films, including The Wicked Lady (d. Michael Winner, 1983) and The Brylcreem Boys (1996). Autobiography, A Touch of the Memoirs, 1982; Laughter in the Second Act, 1985.